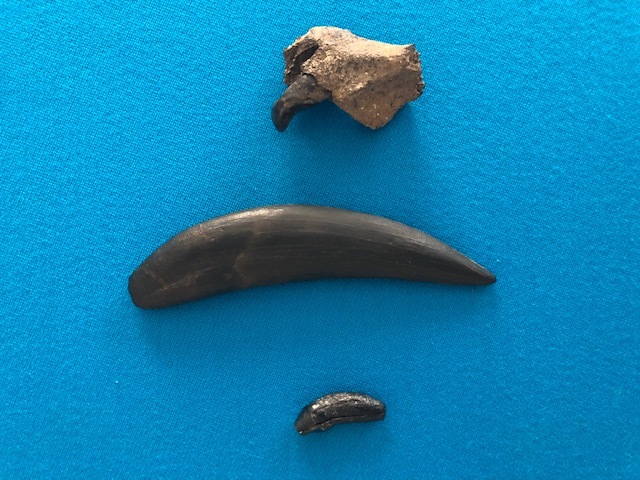 Species description: The long –legged Nimravid saber-tooth cat (one of larger one)with razor –sharp sabers and the second earliest saber-tooth cat that roamed North America beginning in the Oligocene Period 35 MYA -23 MYA . 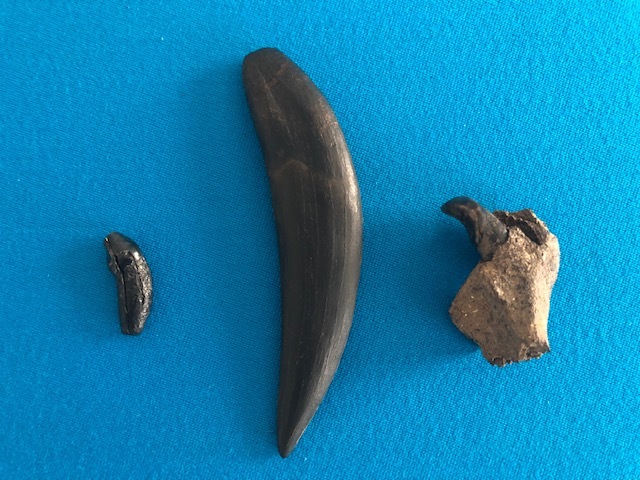 These animals had a lot of physical characteristics similar and exact to Smilodon including famous saber-guards and similar sabers while smaller . They stood at over 2 ft tall the size of a large bobcat, and were more of a group predator with a close knit families as evidenced by some hoplos found together in death while overall very rare species hunting an abundant food supply of grazing ungulates including camels and oreodonts. Using their highly developed saber-teeth they would likely sever the blood supply in the neck of their prey in the initial attack. 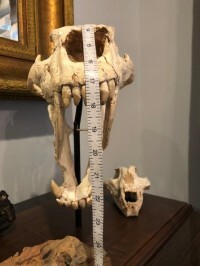 Item location: Asia Item description & rating:1-10 9.8 Unbelieveable OF HIGEST QUALITY Male SABER-TOOTH)Called Asian Smilodon over 90% original(est 95%) including 100% of all teeth. 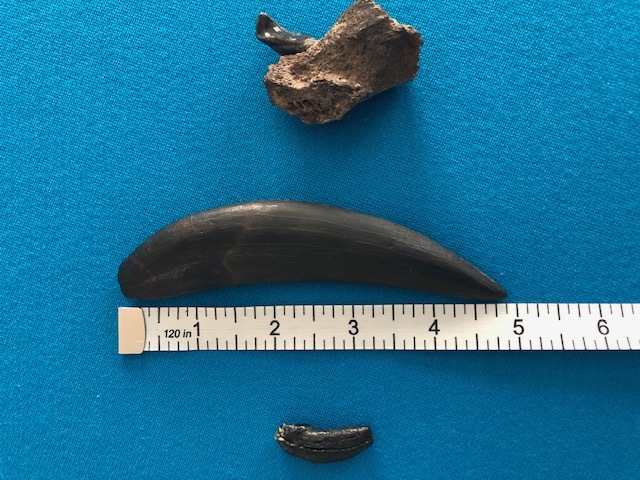 This Male had Sabers 4.5 “ Long and all teeth 100% original to this cat. And one of best saber-tooth cats you will ever find, and was found by a farmer many years ago, and has in the USA for 25 years at least. I acquired here in USA from a dealer in years ago(25) and now selling for someone else. 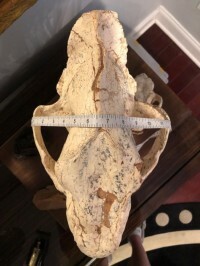 The bone is super color with spotted beige throughout and the teeth are so magnificent with all teeth original. Values a have grown a lot. 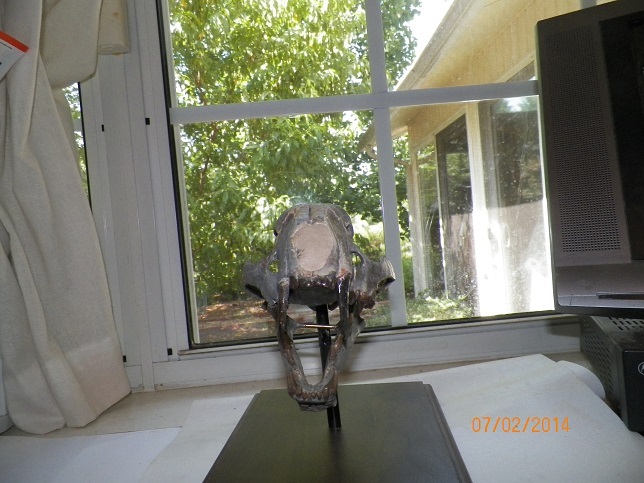 Basically no restore except for small amount on sagittal crest and small part of back of lower jaws. Prep was done by the best prepper in the world. Pictures do not do this cat justice at all .This piece will be displayed at many events for true appreciation. If you want to talk about it please call 706-235-2694. Bone quality is so good it makes me cry on this one. Great ones are so hard to get anymore. This will go fast. Its not mine but a friends and not with me . This is a large one . 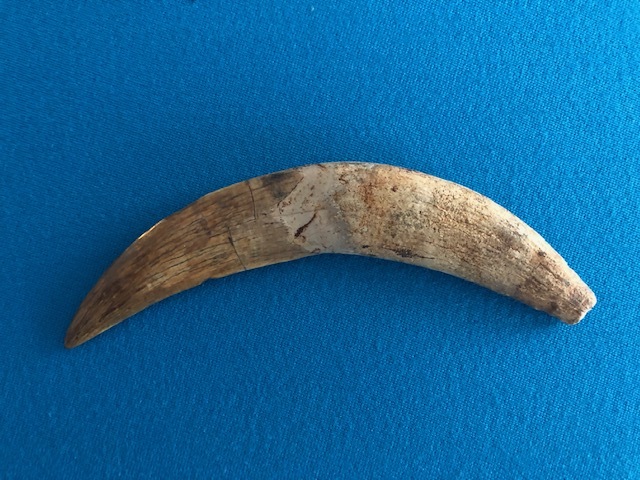 Item rating and description: 1-10 10 Most Prized & Rarest Fossil on the Planet Spectacular SMILODON SABER with Root 7.5” Around Curve 95% original SABER . . This is so amazing I own this Spectacular piece of saber cat History . Nothing anywhere can complete with something that few have in the world .Its 7.5 “ long around the curve . These are rarer than smilodon fatalis and I have two of them. These are the only gracilis sabers I ever saw . It has 1/8” of the tip restored and that is it .The rest is all natural . It was broken in middle and no crack fills . Color is outstanding with a fine, golden yellow patina so beautiful. 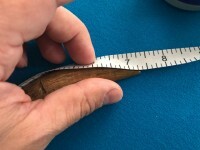 It’s over 1 ¼” wide and is simply great. Well I could talk all nite about this but just look at pictures. Since these are irreplaceable its mine forever . Maybe someday saber fans Ill agree to a huge price tag but you’ll have to wait a long time . This is being sold for a friend and will probably have you contact him direct . Famous Leisey Shell Pit SMILODON SABER-TOOTH CAT 5 ½” COMPLETE SABER with Root 100% Original Plus 2 Incisors –One embedded in Upper Maxilla –Rarest One of Most Beautiful Fossil in the World. Species description: Early Smilodon smaller than other 2 species before fatalis but living up to 500,000 years ago. Well known for killing mammals with its saber fangs alone. 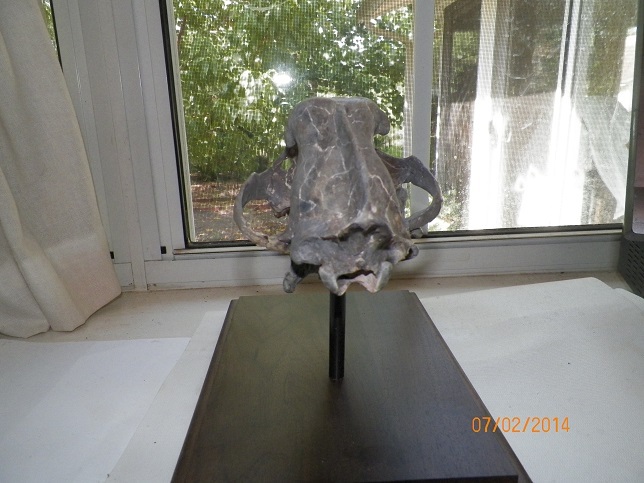 This is the most prized fossil piece on the planet . 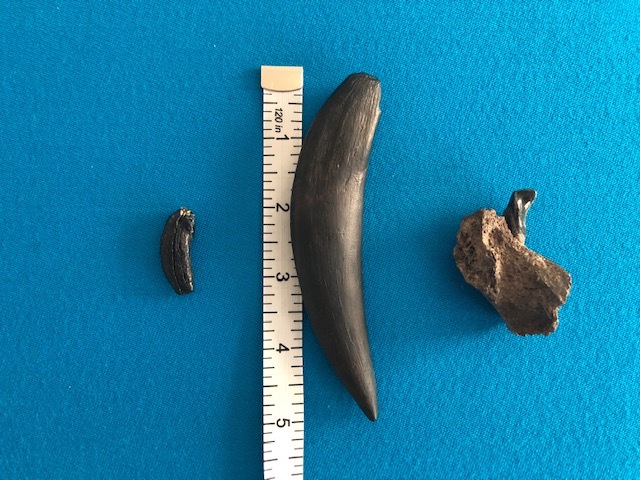 It had a height of about 4 feet with teeth about 7 inches long . 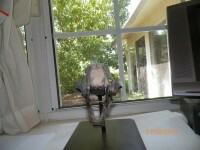 Its hind limbs had strong adductor muscles so could leap and run fast , but were shorter than front limbs . They hunted prey by stealth. IT could open its jaws by 120 degrees more than any other cat ever . It weighed about 75 l kilograms or size of a modern jaguar . It evolved into fatalis, and is much rarer as its much older , and harder to find . 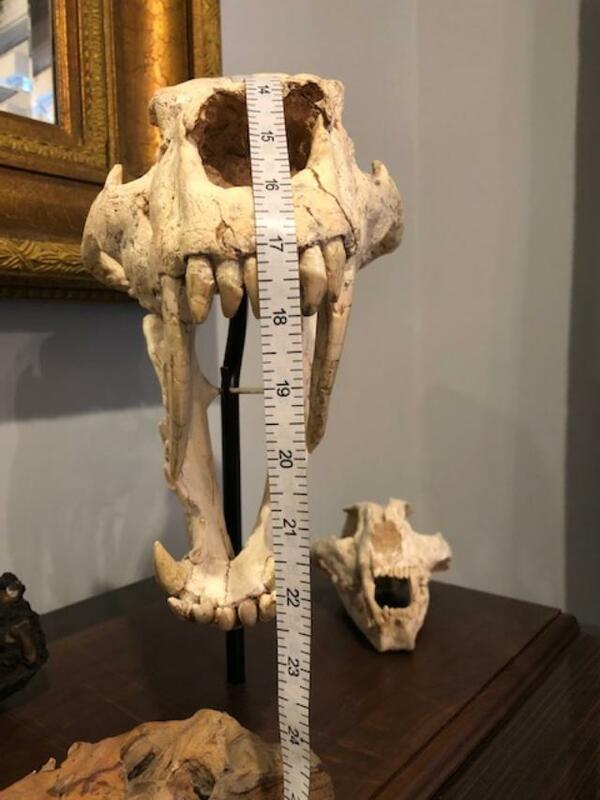 Item rating and description: 1-10 10 Most Prized & Rarest Fossil on the Planet Spectacular SMILODON SABER with Root 5.5” Around Curve 100% original SABER with 2 Incisors with Partial Front Skull Piece . This is so amazing I own this Spectacular piece of Saber Cat History. Nothing anywhere can complete with something that few have in the world , and I have two of these .Its 5.5 “ long around the curve, and has serrations and also a beautiful dark Black patina . One incisor was found in the upper maxilla skull piece. 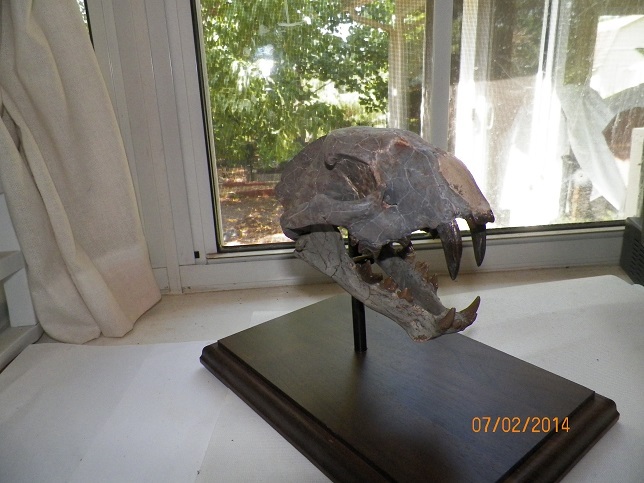 These are rarer than smilodon fatalis and much older, and I have two of them . 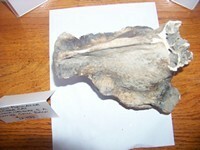 IT’S really has the same size saber as other gracilis I have but the root is smaller –that is it. Both sabers are actually ABOUT 3.75 “ LONG. These are the only gracilis sabers I ever saw . It was broken when someone hit it with a shovel but was actually never broken over 500,000 years until man did it . The serrations are really very good as well as saber and root and its 100% original with one crack fill in middle .The entire front and back of saber are perfect. It was broken in middle with crack fill. Color is outstanding with a DARK BLACK PATINA so BEAUTIFUL. Its APPROX 1.25” wide and is simply great. 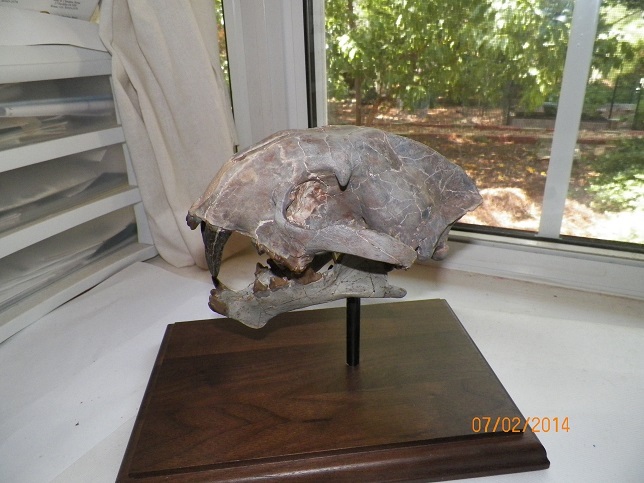 Anyway this has a Maxilla with incisor attached naturally as it’s never been out of the skull section . 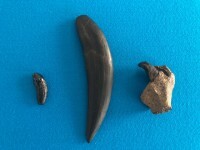 You just can’t find these anywhere .One incisor is by itself but all of these 3 items belong to same cat. You could be trying for 10 years to find just one for sale as no one is crazy enough to sell unless they need funds, and I don’t need the funds so you know what that means. Just take a look at picture. Since these are irreplaceable only one will be able to won this . Species description: Smaller sabertooth cat belonging to tribe Metailurini . 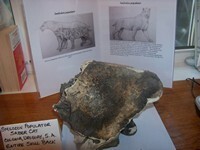 They hunted in groups and were carnivores from USA , Europe , Africa and Asia or then Eurasia. Some are found in Florida but these are very rare . 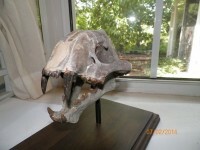 Item description & rating: 1-10 10 Unbelieveable rare Metailurus saber-tooth cat skull with skeleton 100% original. The skull is 5.5 Inches long with matrix 10” x 8” with tons of bones . This cat is so rare few have this saber cat and to get one 100% n restore with much of the skeleton is amazing at a great price at a rare location. This was purchased 25 years ago at least in USA from a French dealer. These cats were in a wide area all over the world but little is found especially a skull with a skeleton. This matrix has bones all over inside as you can tell from the ends of the matrix. One tooth has been repaired but all natural. The bone is super light color and matrix has penetrant sealant on it to make sure matrix is sturdy. Values have grown a lot. These just don’t come around .Its time someone else had it. 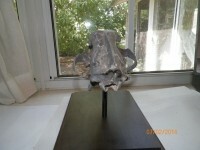 I’m charging under what a skull would cost, however, none exist now so it’s one of a kind. 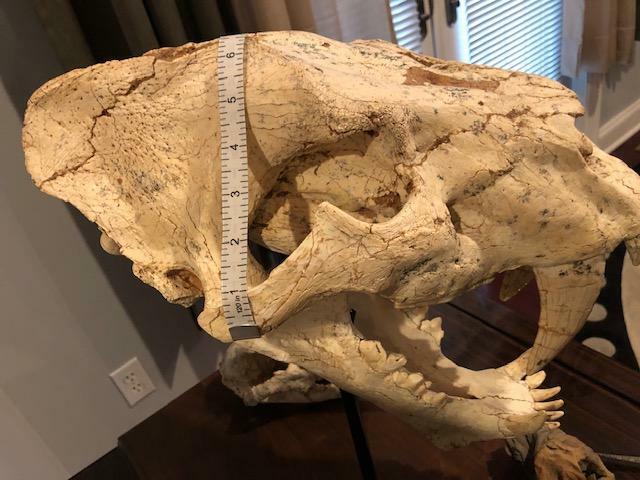 Item rating and description: 1-10 9.3 Gorgeous High Original 82%- 85% Original Hoplophoneus Saber-Cat Skull 8.25”long with long 2.75” Sabers. One saber is a cast one original . The bone part is simply fantastic . Any cat over 75% now is remarkable. Cats are so rare this year . The upper is 90% , and lower is fine also with all teeth real except smaller incisors which is normal . This is one of the best cats I’ve had even though one saber restored. The right one I believe is real . 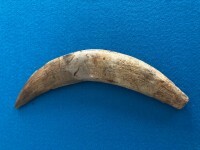 It was found by a top hunter last year . It is so well prepped it is impossible to tell any repaired or restored areas which are few. The color, shape , teeth, bone quality are impeccable . 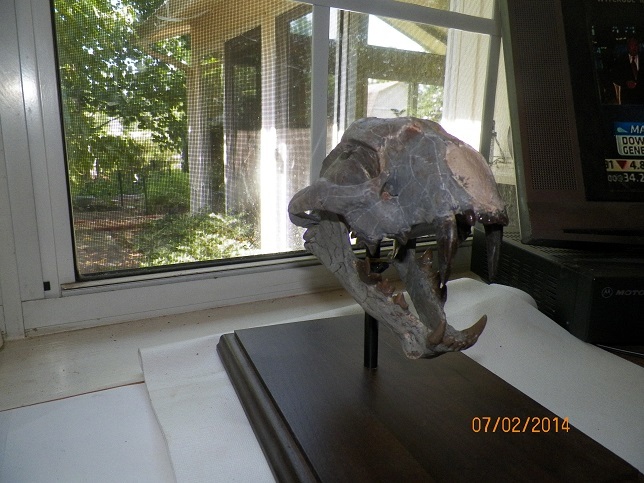 The molars and premolars are real and great .MY prepper said so many great things about this cat. It’s not perfect but really gorgeous . It’s one of the most beautiful cat you will ever find. Due to rareness prices have soared for wholesale . The Bone quality is magnificent. 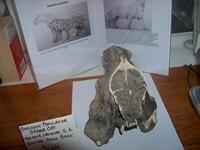 This cat is the most highly desired vertebrate fossil in the world due to its resemblance to Smilodon and old age. 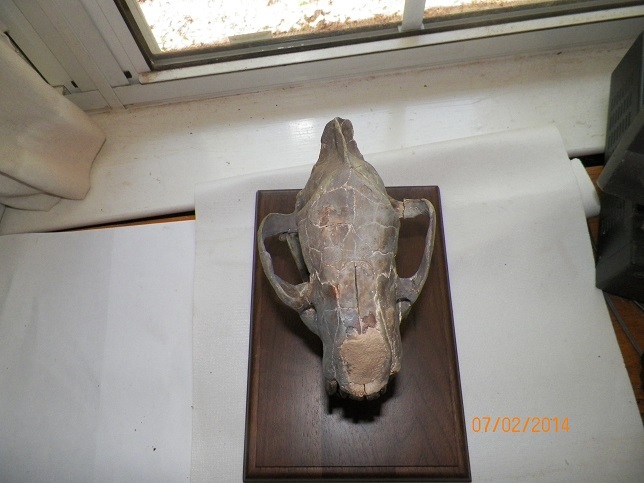 The upper skull was just outstanding as I saw it before prepped and had everything, and stood out as magnificient pure shape and completeness including almost all of saggital crest. The lowers have a little restore in back as most do. This is one I won’t mind keeping, but it can be yours. An animal this good should go for a lot more than I’m asking now, as I’ve seen many sell for thru the years. I will not discount a pure beauty in nature. The size is huge as are sabers. You rarely find them this big but here it is. I have more pics if you need it. Prices to get these have risen as few are found anymore. No cast were visible this year at show as I had to call all my contacts and make arrangements before so you can’t get these anymore. I just can’t ever say enough about this cat . If not appreciated I will glad keep it for my personal collection.. 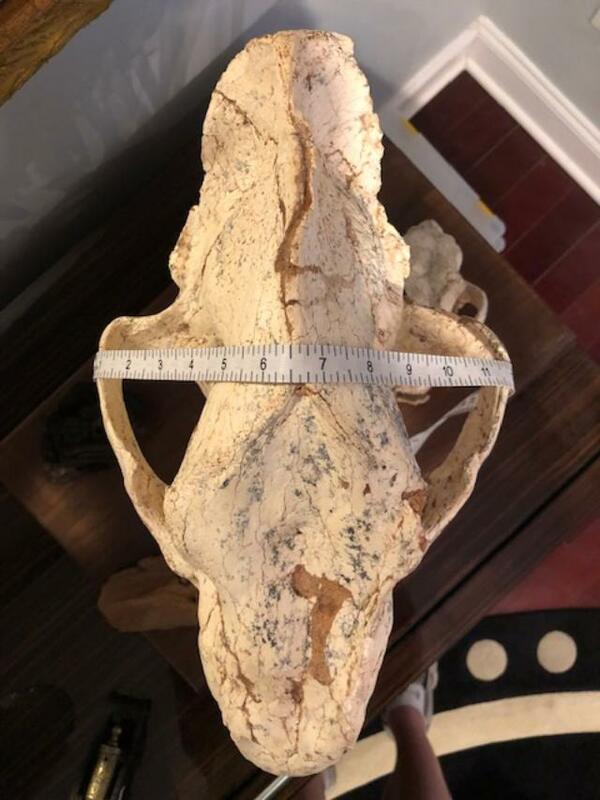 Entire skull is so great you’ll be sorry if you go for a cheaper 70% skull . If you can afford this it’s a beauty. 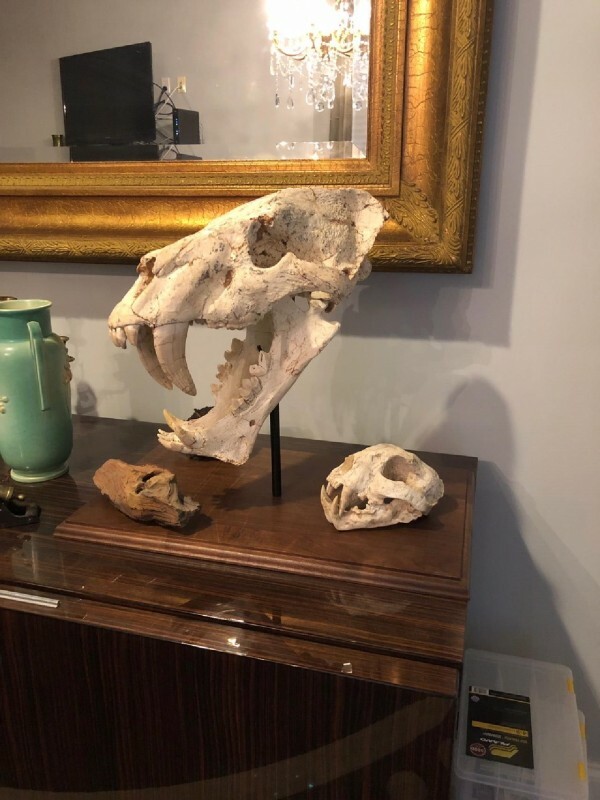 It’s for anyone who loves sabercats whether top collector or first timer . 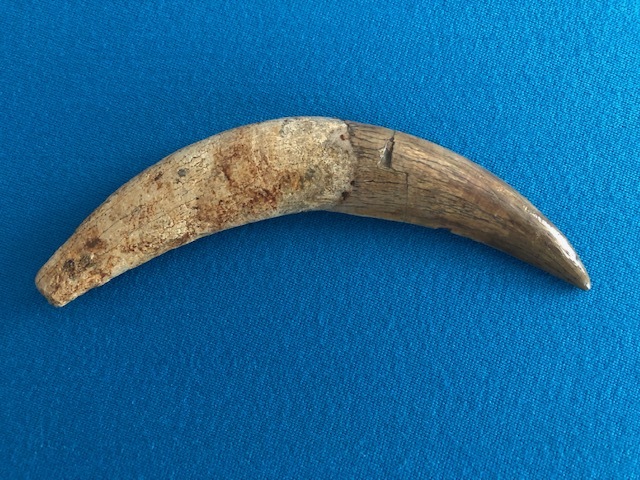 Species description: The long –legged dinictis with razor –sharp sabers was the smallest and the earliest saber-tooth cat that roamed North America beginning in the Eocene Period 45 MYA -23 MYA . They stood at least 2 ft tall with cheetah-like habits and diet, and were solidary predators hunting an abundant food supply of grazing ungulates including camels and oreodonts . 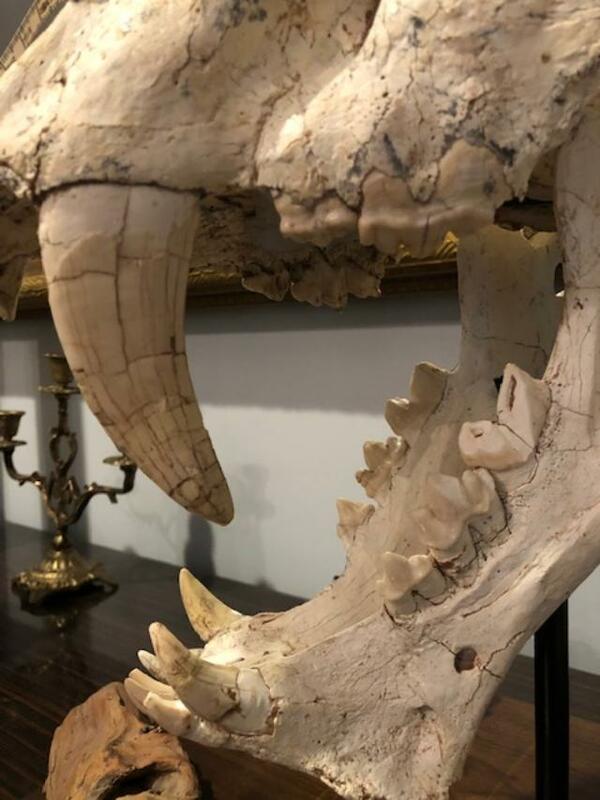 Using their highly developed saber-teeth they would likely sever the blood supply in the neck of their prey in the initial attack. 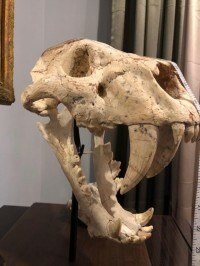 Species Description: This is rarest of all sabertooth cats in USA that lived from early Miocene 6-8 MYA and were the size of a modern cougar or puma . 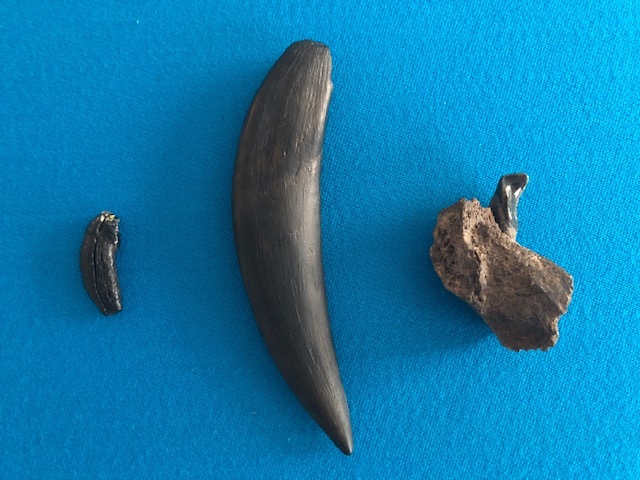 Its body also had the same shape as a puma also, and had long compressed upper canine-sabers that hunted small birds and mammals in ambush . 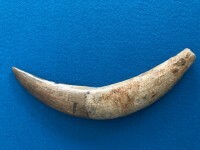 This cat is a false saber-tooth cat and had retained a second upper premolar, which is unusual for a cat . 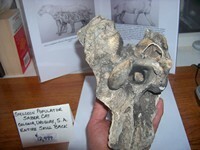 It was the second largest of the late Miocene cats and was an Eurasian immigrant. 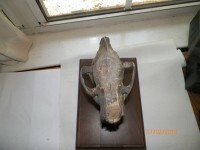 It was a metailurus cat, which besides this species and one other was only found in Asia and a few in Europe. 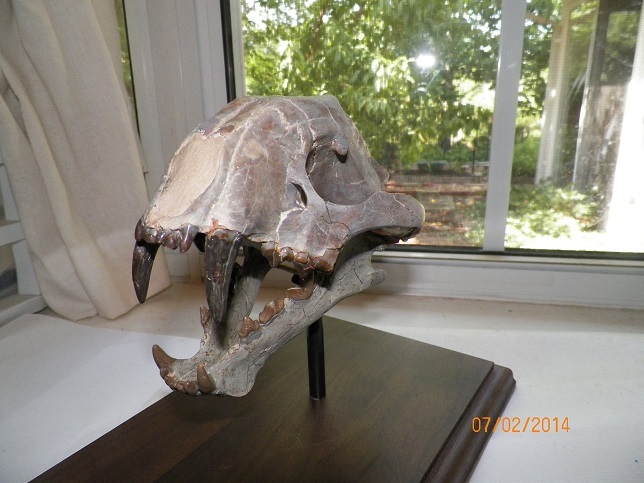 It is not one of the top 6 saber-cats found and has only been found with partials with top of skull never found in USA according to reading all documents . 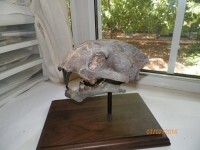 It was identified by Hilbert in 1934 with only a few skull pieces and a few partial bones ever found so this skull is the most complete skull known to exist. 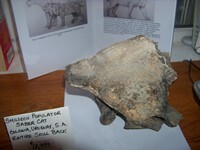 A partial humerus, radius, ulna first phalanx and was named after the first skull jaw section found in Kansas. 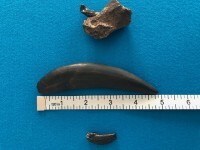 Most of bones found in Arizona in this small area, and one found in Bone Valley, Florida also.